Front row: Glinish, Pamela, Jose Luis, … Back row: Luis, Milagros, Tania, … You get the idea. They were my students at ICPNA a few months ago. I always ask them why they’re studying English, what their goals are. Some examples: Pamela (the youngest one on the first row) is studying at UNSAAC to be an accountant, so is Tania (3rd. on the back row). Williams (2nd. from right on the back row) is a tour guide and Sharon (next to him) will probably be accepted in the performing arts program at the Católica in Lima. 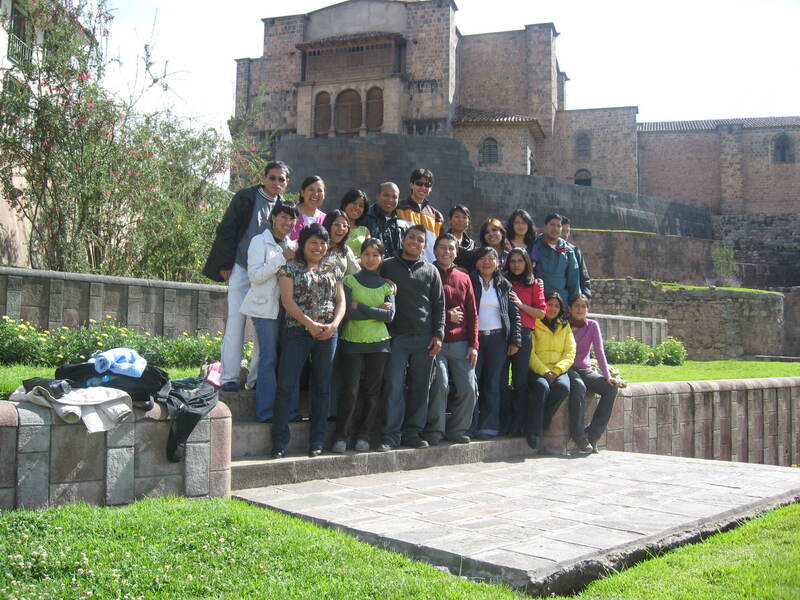 Jose Luis (front row) is studying medicine, his father is a doctor and dentist. Not one of them ever told me they want to work a menial job in near slave-labor conditions for little money to support some fat cat CEO’s illusion of competitive advantage. Some of the students at ICPNA may be privileged compared to the average Peruvian, but others proudly tell me they are the first generation in their families who have the opportunity to study and pursue a professional career. All of them are working hard to get a better life. The old idea of globalization, selling natural resources to multinationals, outsourcing jobs for cheaper wages or moving factories to avoid environmental regulation is simply doomed – and that’s a good thing. Old style globalization often did not add any tangible value, or improve the lives of the average Peruvian (or middle class America). Globalization 2.0 will be about real value, exchanging goods, ideas and services based on differences in geography, culture, infrastructure, economies of scale, etc. This entry was tagged business, corporate culture, globalization, international business, Peru. Bookmark the permalink. But… but… Garcia specifically promised the United States a bunch of moronic workers who will work for almost nothing. He even said it in very similar words to US officials, before backtracking to the Peruvian press, then saying it again at APEC. Are you telling me Peruvians don’t want to work for a penny an hour? Well, I’m stunned. In a word: no! Old-style globalization is a self-defeating exercise in futility. Actually I happen to believe a revalidation of technical skills / skilled labor will be one element to economic recovery, so it’s not to say everyone needs to be a professional. Don’t get me started on Alan Garcia… I moved to Peru on the premise that I had a contract to work for the Peruvian Air Force (FAP). We were to rebuild the jet engine shop at Base Las Palmas, where the FAP services civilian airliners to make money for the Peruvian government. In his infinite wisdom President two breakfasts decided to reassign the FAP people to some desk job in downtown Lima and that was the end of my contract. But… I’m sure they easily found some other guy in Peru who spent the last 5 years at GE’s jet engine facility (where 80% of the world’s jet engines are built).